The Secret Service is investigating several death threats made to the president on Twitter following Sunday's vote to approve the health care reform bill. "ASSASSINATION! America, we survived the Assassinations and Lincoln & Kennedy. 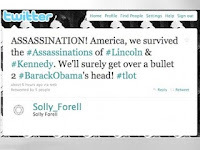 We'll surely get over a bullet to Barrack Obama's head," wrote one Twitter user, who goes by the handle Solly Forell, and identifies himself as a conservative blogger and "'authentic' African American." Soon after the first post, Forell tweeted another message actively encouraging someone with a "clear shot" to kill the president. Another Twitter user who called himself THHEE_JAY and was identified as Jay Martin, tweeted "You Should be Assassinated!! @Barack Obama." Martin, who is black, followed his tweet, writing "If I lived in DC. I'd shoot him myself. Dead f***ing serious." As of Monday morning Martin had 1,575 subscribers to his feed and Forrell had just 321 -- both modest by Twitter's standards. Forell's name is attached to several makeshift conservative blogs, Anybody But Barack Obama2012 and the Audacity of Hype. Twitter removed the posts but the users' accounts remain. Freepers are claiming that the posts were plants by the left to make the right look bad. A little late for that.